Commissioned in 2005 by violinist Antonio D'Andrea. One movement work. 4 pages, 8.5" x 11". Audio clip performed by Antonio D'Andrea. (5-string electric viola and Electronic soundscape). Requested in 2006 by violist Martha Mooke. Score and audio track available from Activist Music for $25.00 print; $17.00 digital. Vista, written for violinist Antonio D'Andrea, pairs the depths of electronically created soundscapes that swirl through the environment, with the beautiful purity of an unamplified violin that sings through the thick, sultry air. We can see great distances with our hearing, and hear great emotion with our heart. Each day we rise, the landscape before us is a vista of possibility. It is up to us to hear the truth in all we are shown, and to act upon it with grace and love. "Alex Shapiro's electronically enhanced 'Vista' is a spherical sound universe in whose mysterious ambience the violin conjures up the spirits of nature - meditative and full of reverence." "In the midst of [Vista] the word "elegy" came to mind... when the death of Shostakovich was announced on network radio, the end of the Fifth Symphony played in the background as a short obit was read. Then, without a word--and no word necessary, the music played on alone to its conclusion. Perhaps when I am long gone and it is time for you to move on, your recording of this piece might serve as a similar tribute--an elegy for those who remain, a new Vista for you." 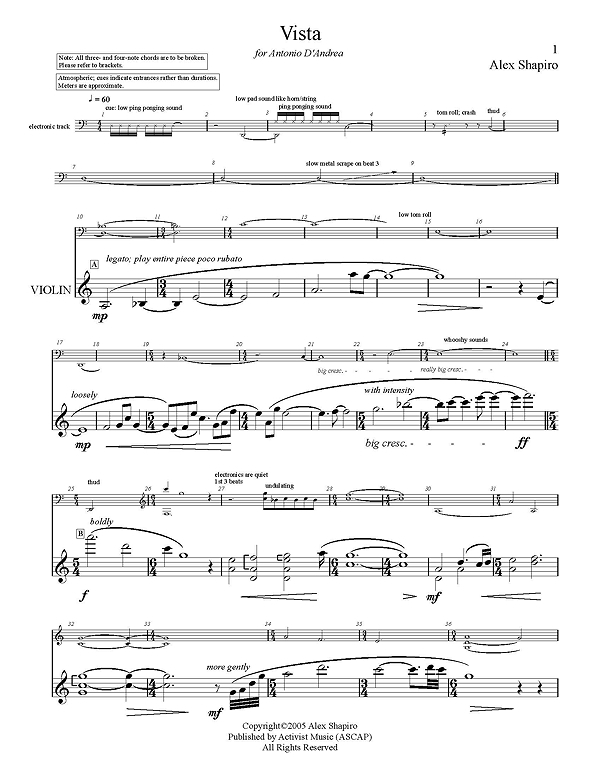  Philip Wilkinson, writing to violinist Karen Bentley Pollick after the March 2010 U.S. premiere of Vista.